I am born in the Netherlands and since my childhood I was continuously surrounded by animals. Even during my childhood adults were surprised how I could handle animals safely and easy. All the time after school and during the weekends they could find me besides horses. After high school I studied garden architecture and became a teacher on an agricultural school. The school was located in a city were a lot of students had learn- and behavior problems and social disadvantaged. I noticed that working with these pupils gave me a lot of satisfaction and I had excellent results with them. After 5 years of teaching I became a guest teacher for all schools who were located in a social disadvantaged area of The Hague. Because there was a lot of criminality, vandalism and violence in that area the school gave me a dog for my own safety. For raising this pup I went to a specialized training institute. Within a few weeks they asked me to become instructor myself. The insights I got there I use still now, especially in the behavior of animals in combination with humans. That was the basis for my coaching. In 2001 I moved to the east part of the country and, because of the presence of a lot of nature, I started horse riding again. After a few years and a lot of training and courses I decided in 2004 to work professionally with people and horses. In 2004 I finished my training as specialist horse behavior and behavior therapy. After that I followed the training Centered Riding Instructor. I started in 2007 the training Healing Touch for animals which I finished in 2013. Since 2004 I work together with Toine. We work close together. I develop and execute the exercises while Toine is observing and give the feedback to the participants of the workshop. Due to our long lasting relationship we understand each other what is a real benefit for our customers. Due to my years of experience and the learned skills I dare to say that I am one of the few coaches who can work (safely) with horses that I don’t know. At the spot I can choose the right horse for the right exercise. I have all necessary certifications (like EAGALA and EAHAE) to execute a safe and exciting workshop. 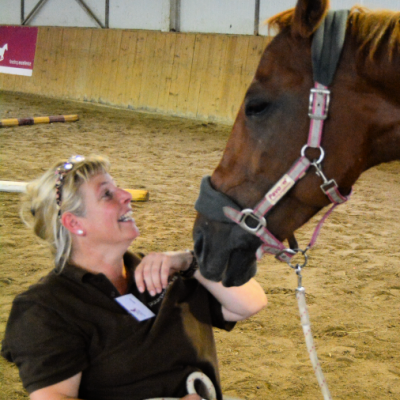 The last that I want to mention is that I am also working for special schools to help, together with a horse, children with social and behavior problems.